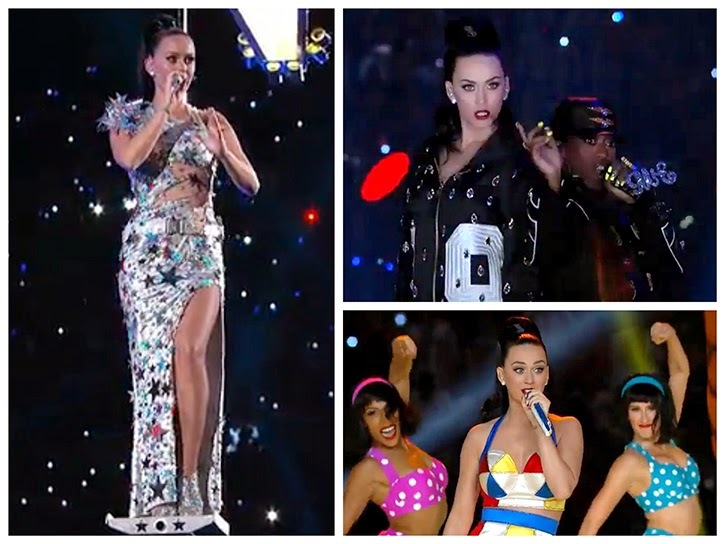 Pop diva Katy Perry nailed her Super Bowl Halftime show last night. I’m not a football fan per se, but I was entranced by Perry’s spectacular costume style courtesy of fashion designer Jeremy Scott. Her concert looks were not just a feat of style, but also logistics as each costume design had to fit inside another for quick changes during the performance. 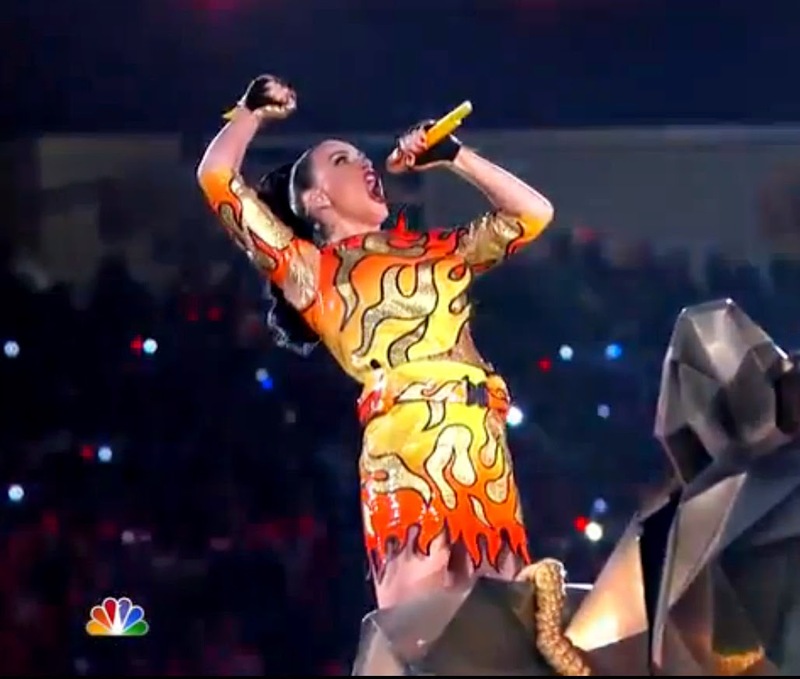 Katy Perry roared onstage on top of a giant metallic lion in an intricate flame suit. 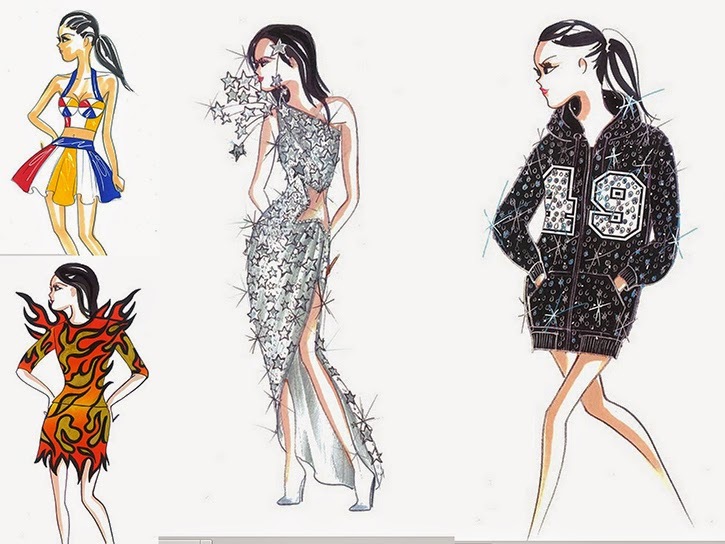 A frequent collaborator with Perry, Jeremy Scott took inspiration from the flame shoes of his previous collections. This outfit consisted of leather flames airbrushed with an ombre effect and bound in black leather, appliqued onto patent gold leather. Her next look was revealed to be a cheeky beach ball dress to coordinate with dancing backup sharks, palm trees and a troupe of ladies that looked like they had escaped a Fanta commercial from 2003. The beach ball cups in her dress were amply filled…No deflate gate here. The choice of Katy Perry and surprise guest rapper Missy Elliot was not a frivolous one. Football as a sport has had several controversies with regards to assault and domestic violence. Showing strong women at the top of their game was a deliberate message. Jeremy Scott insisted on the sparkling hoodie costume for Katy Perry to complement Missy Elliot (who looked and sounded great BTW). This look was not a part of the original lineup, but Scott felt the pop star really needed a look “to get her freak on”. The immense amount of bling Perry wore can be attributed to accessories designer Erin Lareau. There were reportedly 22 000 crystals applied to Katy Perry’s costumes and bedazzled microphones for the night’s performance. Along with Lareau, the singer wore elaborate diamond pieces by Lorraine Schwartz. The final costume, Katy Perry’s star spangled dress was actually a look by Jeremy Scott’s collection for Moschino. He used Mylar and holographic materials to create the stars that were applied to the slinky silver lame dress. The silhouette was very “Jessica Rabbit”. The intent was a mix of B-movie Science fiction and Old Hollywood glamour. The look was perfect to watch Katy Perry soar into the sky on a shooting star. Her style, the fashion, the show was something dreams were made of!